On the twelfth lunar moon of the Thai calendar, there is a very special Thai festival, known as Loy Krathong. The festival occurs in November and this year it will be on 22nd November 2018. Thai people celebrate that the rainy season has ended and the main rice harvest has begun. They give thanks to the Water Goddess, Phra Mae Khongkha, for the abundance of water in the past year and also apologise for the pollution ensued. The name ‘Loy Krathong’ loosely translates as ‘to float a basket’ which is the main activity of the celebrations. On the night of the full moon, people light candles on their ‘krathong’ full of flowers and release it out to sea or onto the river. Coupled with the party atmosphere, the twinkling lights and flowers make a truly magical sight. People put a lot of effort into decorating the baskets, with beautiful flowers and candles. Krathongs are traditionally made from banana leaf. It is best to avoid ones that are made from polystyrene as these are damaging to the environment. Want some extra luck to go with your Krathong, then include a lock of hair or nail clippings and some small coins. Because the belief is that bad energy from the previous year will float away with the floating basket. The krathong symbolises the release of bad energy that you have acquired in your life over the past year. Therefore if the candles on your Krathong stay lit until they out of sight, it is said that you will have good luck for the year ahead. Where can I celebrate Loy Krathong? Anywhere there is water…. This festival is second only to Songkran in the Thai calendar, so expect it to be a big occasion. Most tourist areas and hotels will celebrate the festival with shows of various kinds, plus their own place to release your krathongs and lanterns. Notably, Sukhothai was the first place to celebrate the tradition and is a wonderful place to see the festivities. In fact, it is our top pick of locations. Sukhothai was originally the capital of Thailand, and its name translates as ‘the dawn of happiness’. The legend of Loy Krathong is the story of the first person to float a krathong. Her name was Nang Noppamas, a beautiful consort of the king of Sukhothai. King Ramkhamhaeng was so impressed by the beauty of the consort and the krathong floating that he made the ritual into an annual tradition. Beauty contests known as ‘Noppamas Queen Pageants’ are held in her honour every year. The traditional Thai costumes and dancing associated with the pageants are delightful. Chiang Mai has a week-long celebration during the festival and this city is the location of the largest gathering of people in Thailand for Loy Krathong. 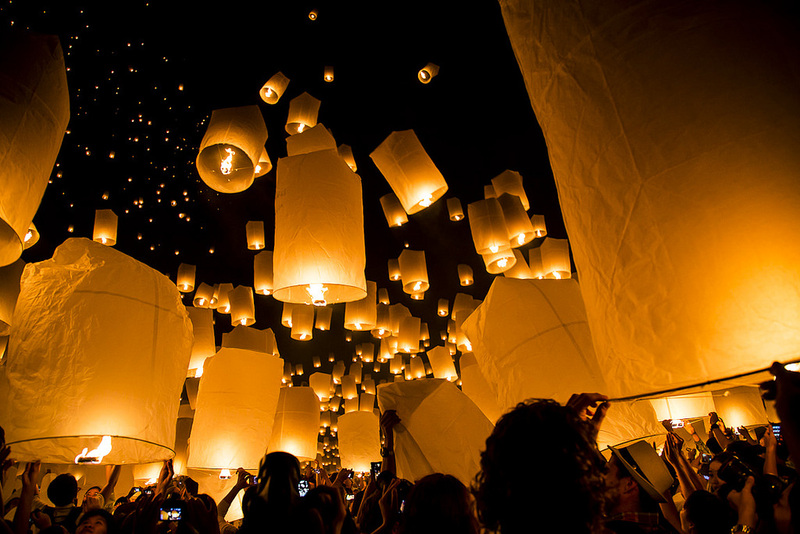 There is also the Yee Peng the festival of lights, where thousands of Thai lanterns, are released into the night sky. People attach small coins and locks of hair to the lantern before releasing it. Bad energy from the previous year is thought float away, just like with the krathongs on the water. Firecrackers are even attached to the Thai lanterns add a bit more excitement! If you intend to visit Chiang Mai for Loy Krathong, book early since train tickets, flights and accommodation will almost certainly sell out. If you want to release a lantern for the heavily attended Yee Peng, you must also book this in advance. 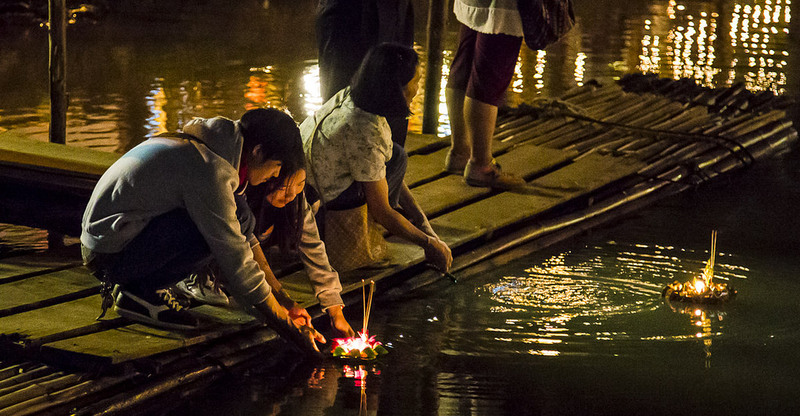 Amphawa is another great location for the Loy Krathong Festival. Amphawa is a famous and historical town close to Bangkok, with an amazing riverside location. Large-scale folk theatre productions are put on alongside the Mae Khlong River which are magical. Yes very. Many couples will make their krathong together or choose one to buy one that they both think is beautiful. They add locks of their hair and nail clippings, then light the candles and incense and release the krathong. The couple watches together as it floats away. It is said that if the candle stays lit until the krathong is out of sight, then the couple will have everlasting love together. How’s that for romance? Loy Krathong is one of the most romantic Thai festivals, with spectacular visions of light. It is hard to deny the beauty and love that is found on this most wonderful day in the Thai calendar. The traditional Thai music and dancing are sure to make your evening with your loved one very special indeed. Loy Krathong is enjoyable for the whole family. Children enjoy taking part in the making of the krathong and then seeing who wins a prize for the best one. There are often arts and crafts activities that children can engage in too. Getting dressed up in traditional Thai costume is also fun for kids. Many resorts have raffles, face painting and even a fun fair. At night there is entertainment, fireworks and music to mark the occasion. Also, Loy Krathong involves typical Thai style markets in all the bigger towns, selling souvenirs, kitch, crafts, clothes, jewellery and deliciously sugary snacks. Try local fruits and juices such as Guava, lychee and mango. There are even the deep fried crispy insects on offer! Also, traditional Thai sweets known as ‘kanom’ made out of coconut and sticky rice and can be found wrapped in banana leaf in little triangles of joy. Wherever you spend this year’s festival, be it at a huge party in Bangkok or a small local village, you are sure to capture the spirit of the Thai people. Thais enjoy this favourite of festivals and you will be thrilled at their kindness and generosity.